If you’re looking for a special, custom made Edge Lit Sign you are in the right place and will soon be talking to an experienced MegaLED engineer who will help you through the best options. MegaLED have specialised in the design, development, manufacture of cutting edge lit signs and associated LED Edge Lighting Display Hardware since 2003. Our edge lit signs are completely decorated, ready to install edge lit displays which will make your company and brand logos look stunningly illuminated. MegaLED edge lit signs do not just have proven reliability, incredibly low power consumption and look absolutely brilliant, our keen prices and professional trade service makes them a totally desirable, “wise buy”. 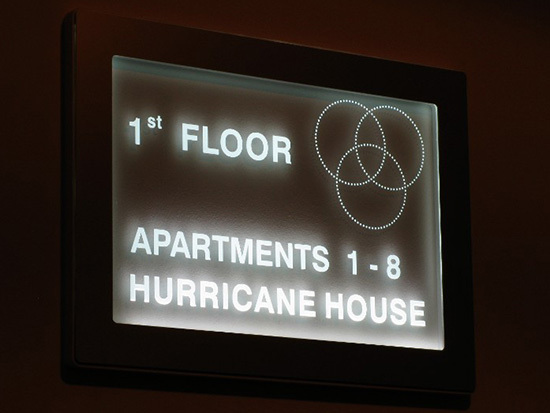 You can see our latest range of illuminated edgelit signs here. ABLADE our complete range of plug-in and power acrylic edge lit signs, typically sold with 1,2 or 4 light injector profiles. Made in a selection of sizes from 150x150mm to 3000x1500mm in one piece. Original, registered design offers total design flexibility by configuration. Sold complete, ready to install with relevant fixing kit/s. > Infills, Flat cut letters and optional backing panels. > Overall Sign Panel depths of just 12mm. Backed up with industries fastest edge lit sign pricing service*. All signs QC’d and digitally photographed prior to shipment. Our latest superslim edge lit sign display lighting solution. Nano is ideal for small format interior signs typically with a picture frame concept. CUSTOM DESIGNED EDGE LIT SIGNAGE SOLUTIONS. Brite-Fix is ideal for interior signage applications, 5star illuminated hotel interior door signs, illuminated reception signage, retail directory signage, casino signs etc. Brite-Fix illuminated glass signs are configured and available in a number of light injector and panel sizes.MegaLED’s industrial product design means we are capable to custom engineer Brite-Fix in original ways. Overall sign panel depths from 20mm with 8mm glass panels.Power consumption is from just 2W per sign. Pro-Blade a double sided projection sign, developed recently for a customer now in final phases of design standardisation (as a new product range). Sign depths from just 20mm. Contact us for more details. Power consumption typically from 4W. this depends on sign type, design complexity and production schedules at time of order. If one of our solutions does not fit your requirements and your volumes permit, then MegaLED can help with the design and supply a variety of LED Modules. 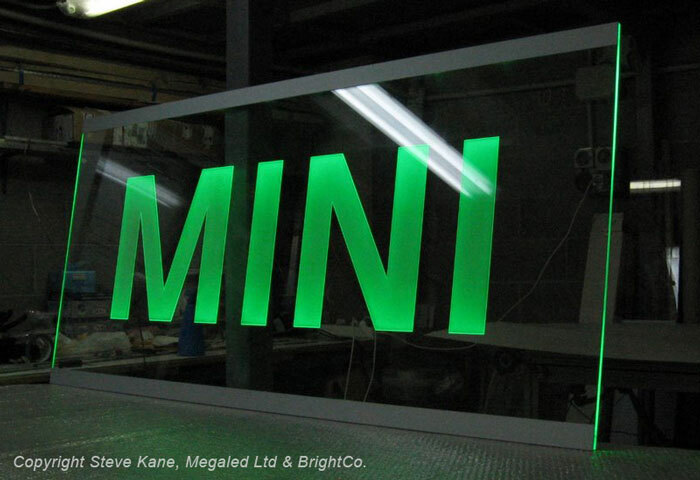 Our products and experience in edge lighting allows sign makers to achieve best results in edge lighting signs. > Please try to upload vector artwork (ai,dxf or corel) or a low res jpeg/bitmap or pdf. > Clearly state sizes and quantities per sign model. > If your information is complete you should receive a same day quotation. Light System was originally designed by our display lighting division BrightCo. way back in 2003 and this lighting system actually won a 1st Place design award from the Association of Italian Industrial Design in the same year. Since 2003 we have made many perfections to our original lighting system, developed a complete our Blade Sign Product range known as “ABLADE” and refined our Edge Light System into, something called the “Flat Light System”. MegaLED’s flat light system is an ABLADE product feature, indeed most ABlade signs are just 12mm thin. MegaLED are very proud to have gone from strength to strength designing, engineering and producing absolutely brilliant, elegant and stunning HIGH IMPACT Blade Signs featuring specialist, high impact panel decorations. 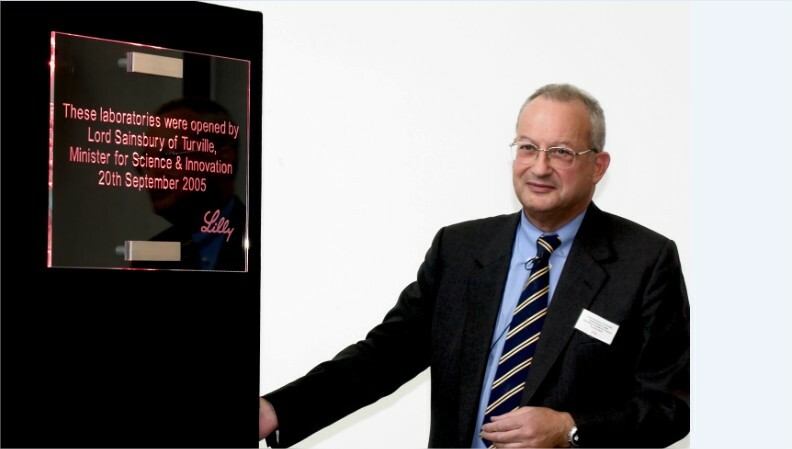 MegaLED specialise in design, manufacture and supply of Edgelit signs. Signs which designed to impress and, be installed straight out of the box, in minutes. MegaLED can also help design edge lit exit signs that are much more stylish than the usual products available. Below: BriteFix Unique Edge Lit Glass Signage.